Queen Elizabeth II was crowned on June 2 1953, aged just 27. This year we are celebrating the 65th anniversary of her coronation at Westminster Abbey. Coronations throughout British history have been synonymous with ceremony and symbolism. There is perhaps no greater iconography associated with the coronation of a King or Queen of the British Isles and Commonwealth, than the Crown Jewels. Two crowns are worn during the coronation ceremony. The first of these is St Edward’s Crown, which has only been worn by Queen Elizabeth II on one official engagement- the coronation itself. This crown, along with all the items worn and held by monarchs of England since Saxon times, was destroyed by Oliver Cromwell after the English Civil War. The metal within the Crown Jewels was melted down and turned into coin, and the jewels themselves were sold. After the Reformation however, St Edward’s Crown (which had first been worn by Edward the Confessor prior to the Battle of Hastings) was painstakingly remade in time for the coronation of King Charles II in 1661. Many of the jewels were also tracked down and retrieved by the Crown to be reincorporated into the coronation collection. Only one item survived Oliver Cromwell’s destruction of the monarchy. This was a golden Ampulla and spoon. The Ampulla contains the oil which is used to anoint the monarch’s head, palms and breast during the coronation itself. The second crown worn during the coronation is the diamond-encrusted Imperial State Crown (pictured above). This crown is the one the monarch also wears on formal occasions such as the opening of parliament, making makes it the most well known item in the Crown Jewels collection. 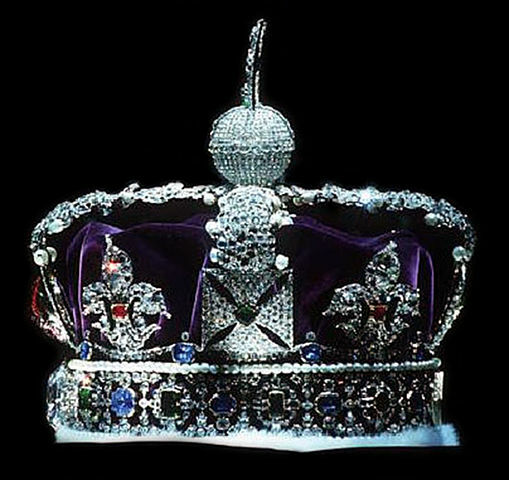 The Imperial Crown of State incorporates many of the surviving historic jewels recovered after the Restoration, including Edward the Confessor’s sapphire, which is set in a Maltese cross at the top of the crown. This sapphire was once part of a ring owned by Edward the Confessor that was originally buried with him in 1066. In 1101 it was removed from his body so it could be set into Henry I’s crown. The sapphire isn’t the only stone within the Imperial Crown which has a dramatic history. The ruby set into the centre of the crown once belonged to a King of Granada. He was murdered by Pedro the Cruel, King of Castille, who then gave the ruby to the Black Prince (soon to become King Edward III), in 1367. Inherited by King Richard II, the ruby was in his possession when he surrendered to his cousin, the future Henry IV, at Flint, Wales in 1399. Later it was worn by Henry V around his helmet at the Battle of Agincourt, and again by King Richard III at the Battle of Bosworth field in 1485. When Richard was killed while fighting, the it passed on again to the next king, Henry Tudor. The crown’s history does not stop there. Worked into its frame are the pearls worn as earrings by Elizabeth I. In addition, the wide jewel-encrusted band that forms the base of the crown contains the Second Star of Africa, a stone cut from the Cullinan Diamond, which remains the largest diamond ever mined. In all, the Imperial crown contains, 2,783 diamonds, 17 sapphires, 277 pearls, 11, emeralds and 5 rubies. Alongside the crowns, the Royal Sceptre and the Orb are well known features in the Crown Jewel collection. The sceptre is made of gold and is three feet long, while the Orb is made of gold, and topped with a diamond encrusted cross – a symbol of a Christian monarchy. As well as all this, the collection contains five Swords of State, some Armills (gold bracelets which symbolise sincerity and wisdom), maces, the Queens orb, sixteen silver state trumpets and a variety of banqueting plate.